Normative values for concussion assessment may need to be age-specific. Younger children are more likely to show more severe symptoms of concussion than older children, with a slightly higher rate among boys than girls, according to a quantitative assessment in JAMA Pediatrics.1 Age was the largest single variable influencing child Sport Concussion Assessment Tool (SCAT3) scores, with worse scores reported among younger children, suggesting normative values for concussion in children should be age-specific. Investigators from multiple institutions in Wisconsin assembled a cohort of 478 child athletes (234 girls and 241 boys) ranging in age from 5 to 13 years (mean age, 9.9 years; standard deviation [SD], 1.9 years) playing in competitive organized sports leagues and teams from May 31 to August 12, 2014. The parents of all children enrolled also participated. The children were assessed at baseline, using the Child SCAT3, a standardized, multiassessment tool for evaluating the presence and severity of concussion in preadolescents aged 5 to 12 years.2 The Child SCAT3 assigns both a parent- and child-rated number score (0-20) and a severity rating (0-60), with higher scores indicating a greater burden of symptoms. The tool also uses a pediatric version of the Standardized Assessment of Concussion score to evaluate the child’s sense of orientation, memory, and concentration, where higher scores indicate better performance. Finally, a test of balance was performed. Children in the youngest age group (age 5-7 years) consistently reported worse scores on all measures than those in the highest age group (age 11-13 years), including higher mean symptom severity scores (18.2 [SD, 10.0] vs 11.3 [SD, 9.0]; mean difference, 6.86 [95% CI, 4.22-9.50]; effect size, 0.74) and lower scores on the total Standardized Assessment of Concussion-child version (mean, 19.5 [SD, 5.1] vs 26.1 [SD, 2.1]; mean difference, −6.59 [95% CI, −7.49 to −5.68; effect size, −2.1). Performance on the modified Balance Error Scoring System and tandem gait tests were also significantly worse in the younger group. These results were in agreement with a previous study by Nelson et al3 showing that younger children had poorer performance on all tasks than older ones, with the greatest effect on slowing of tandem gait. The current study found a larger effect on concentration, where none of the children in the 5- to 7-year age group could repeat 6 digits backward to the tester, and more than 70% of the group did not know the current date compared with 38.9% of 8- to 10-year-olds. Although age was a clear factor in the children’s reports of symptoms in this study, it did not appear to influence their parents’ perceptions; they may have attributed some symptoms (such as forgetfulness or being easily distracted) to normal childhood behaviors. There was a slightly higher rate of all symptoms reported by boys, but to a less significant degree. 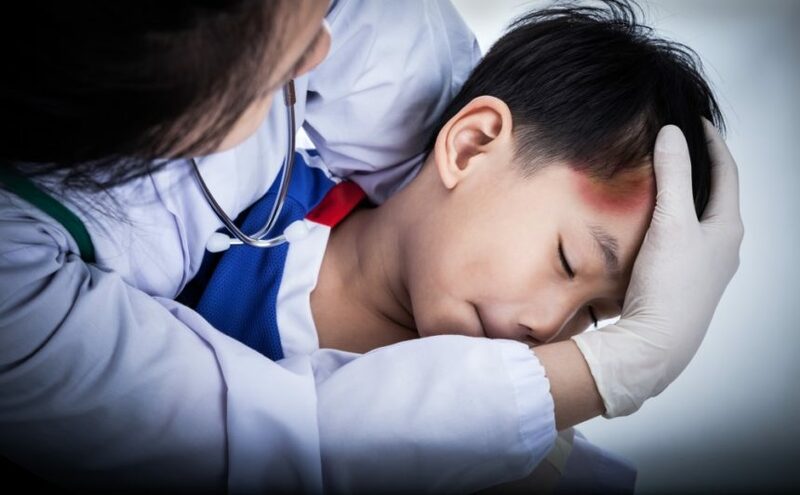 These findings help establish some variations, particularly by age, in the presentation of symptoms of concussion in child athletes that can be important to the assessment of head injuries in children playing sports.